This just appeared in my twitter feed. It interests me as both a nurse and as a martial artist. Given that most of us subscribe to the notion that the martial arts should be both life enhancing and life preserving, where do we / our activity fit into this? I think this is a massively important issue. The leading cause of death for men of my age (45 and under - so I'm just in there) is suicide (a whole new angle on "self"-defence). Depression is a truly terrible thing and I think you have to live it, truly live it, to know how deep it can go. One of the identified reasons why suicide is much more prevalent in men is that fact that men don’t have the same opportunity to talk their feelings trough. We also have the fact men are far less likely to seek help (and there is some great help available to those who seek it). This is part of wishing to seem “strong” and “self-reliant”. The sometimes testosterone driven world of martial arts would, at times, seem to support this mistaken and harmful view of “manliness”. The positive side is that martial arts can provide good friendships and a support network. Dealing with depression takes huge strength. That needs awknowledged. I do have a podcast written on this topic so it will come out at some point. Depression is a truly terrible thing and I think you have to live it, truly live it, to know how deep it can go. One of the identified reasons why suicide is much more prevalent in men is that fact that men don’t have the same opportunity to talk their feelings trough. We also have the fact men are far less likely to seek help (and there is some great help available to those who seek it). This is a big problem, currently I teach for organisation that helps people with mental health, talking to the clients, specially men. Opening up and talk about the problem is the biggest obstacle. When they pass that it seems to be easier (if you can say that), my part in their therapy is to build their confidence and self-esteem through Karate training. After a year I can see improvements in those students who are training regularly. Starting this project also taught me to look on karate from different angle, and now I see it more as a therapeutic tool with enormous benefits to society. That sounds like very important work. During one very dark time in my life (there have been a few) a close friend told me, “your training will be your salvation” and he was right. Another friend recognised the signs of depression I was exhibiting (having suffered from it himself) and it was him who made me promise I’d go to the doctors. I have this thing about never breaking my word. I really didn’t want to go, but once he’d made me promise then I had to. When it was talked through with the GP I realised that I was indeed showing all the signs of depression (and anxiety). I have to say that the health service was a great help. I told the doc that I felt like a zombie i.e. bits dropping off me, but I just kept on going. Being open about it, talking about it, and seeking help, made all the difference. I’ve had a brutal existence at times and I know what being in that deep dark pit feels like. I also know that getting out of it can be the hardest battle you can ever fight. My experience has also been that depression is an inevitable result of having to endure the unendurable for long periods. Just like our bodies, our minds can only take so much and it’s the ones who have the heavy loads to bear that know this most keenly. Those who have an easy existence can never appreciate the truth of this. It is a tragedy that so many men feel unable to ask for help and support. It’s not a sign of weakness. We need to fight smart and not just hard. Getting “tactical advice” from people who know the territory is a smart thing to do. As Churchill said, “If you are going through hell, then keep going”. However, when in hell it can help to know you are going in the right direction. There are people who can help point you in the right direction and avoid making mistakes. Anyone battling depression has both my sympathy and my admiration. It takes a tough SOB to battle it and in doing so you get even tougher, wiser and more compassionate. It’s as martial as it gets. Very well said Iain, Karate is my way of dealing with anxiety. That's why we doing seminar to raise funds and awareness about mental health. I’ve had a brutal existence at times and I know what being in that deep dark pit feels like. I also know that getting out of it can be the hardest battle you can ever fight. My experience has also been that depression is an inevitable result of having to endure the unendurable for long periods. Been there. Several times, intially through school-based bullying. We can only take so much and bullying, even at low level, can take place over several years. Those that know me know that 2009 was my annus horibilis when life changed. I pretty much fell apart mentally and certainly failing to function as a human being. I even went sick from work which is unheard of for me. The year finished with my wedding at which I used my speech to discuss the year, the hardship and the friendships. I discussed how my classes had been a release. At the end one of my young black belts came and told me that they never knew that I was going through all of that. The infographic also tells us that death from violence is part of the less than 1% group. This also is good. Does it? I read it as "each guy means 1 percentage point". The last row has 22 guys in it. So death from violence is part of the 22% group of "other" causes. This does not give us much useful information on the percantage of violence as a cause of death. I would guess it might well be less then 1% but the infographic is not conclusive about that. If you click to adjust for ages, you can see that suicide is the leading cause of death for men under 50. As regards violent crime, there were 526 murders in 2013 (same year of the above linked figures). In 2015 there were 518. So relatively consistent. The ONS states, “In the year ending March 2015, there were 9.0 offences of homicide per million population.” So that would give us an overall yearly chance of being murdered of 0.0009%. Of course, we don’t all have the same chance i.e. young men are more likely to die of violence than older men. Still a very small chance though. One thing that is abundantly clear is that mental and physical health issues are a great deal more likely to end our lives than violence is. This is whyI have stated that martial arts need to be both life preserving and life enhancing. Life preserving should look at both practical self-defence skills and encouraging good mental and physical health. Life enhancing means that the martial arts not only aim to make our lives longer, but better too. We have fun, spend time with good people, have a lasting influence on our communities, and so on. I wonder how many of us started reading this thread with our usual thought process…. More meaty karate based thoughts from the contributors and then were slightly taken aback by the brutal honesty about a topic that society in general shy’s away from. Oh, eh, how do I respond to someone saying they have or had mental health issues? We are not expecting the contributors who generally share their views on how to incapacitate a ruffian be so frank about their struggles. However, if they were talking about karate helping them rehabilitate from a ruptured ACL or torn muscles we would all feel more comfortable with their toughness. The brain is as susceptible as any other part of the body to injury. Its unfortunate society in general see mental health issues as a weakness but wouldn’t consider rupturing an ACL as one. Hats off gents, thanks for sharing! This is a big problem, people do not understand mental health issues, as their not simple. I can see this on the example of fund raising, for mental health not many people donate compare to cancer or children. I think with cancer immediately you know with what you dealing not so much when it comes to mental health. We need more awerness campains in media about this issues. … The brain is as susceptible as any other part of the body to injury. Its unfortunate society in general see mental health issues as a weakness but wouldn’t consider rupturing an ACL as one. I think the only way we can start to change this is by talking and being open and honest. I also think that we in the martial arts are in a good place to do it. We punch each other for fun! It’s as masculine as it gets! So when people like us are discussing these things it challenges the misconception that talking about “feelings” is unmanly. The ACL analogy is a good one … but we can add to it. If someone ruptured their ACL while climbing Everest, but pushed through the pain and reduced efficiency of movement such that they still got to the top, we’d have great admiration for that person. When it comes to things like depression, that’s what is happening. People are often climbing their own internal Everest and the landscape can be so unforgiving that injury is inevitable. It’s not for those at basecamp to critique them or question their courage or manliness because they are “mentally limping” up there, while they stroll around at basecamp. This is a big problem, people do not understand mental health issues, as their not simple. I can see this on the example of fund raising, for mental health not many people donate compare to cancer or children. I think with cancer immediately you know with what you dealing not so much when it comes to mental health. We need more awareness campaigns in media about this issues. Very true! As has been pointed out, if we talk about physical injury or illness it is no big deal. However, there are still issues around mental health. 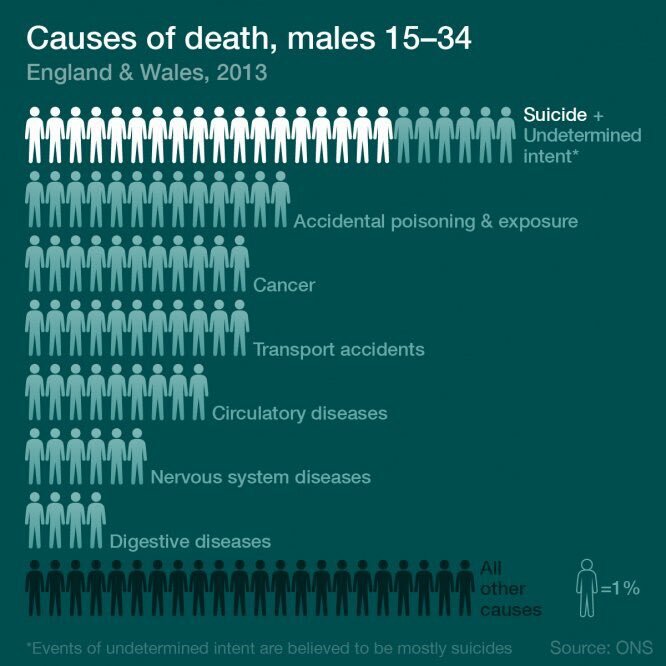 That needs to change because the culturally encouraged silence on these issues is a huge contributor to suicide, and that is the leading cause of death for men under 45! Not acceptable. It's a deep question. As far as the relation to martial arts though, i've noticed that often the Dojo is a place where people who normally are uncomfortable with what they perceive as "spiritual" can actually find something, well, spiritual..for lack of a better word. Maybe to keep any religious angle out of it it's better to say "personal fulfillment" or something similar. I have noticed over the years that people (myself included here btw) who tend towards extremes of cynicism, and probably depression, can often acheive a bit more balanced state of mind through long-term training. I'm sure that any interest/discipline could do the same thing of course, but Karate is structured such that it's particularly well set up for it, because much of the mental end is based on conditioning oneself for a kind of confidence, which if you are a depressive person, is a rare experience. One also learns patience and equanimity on a deep level with years of martial arts training, both of which are huge when grappling with mental health issues. As far as mental heatlh issues generally, simply removing some of the social stigma surrounding them would be the place to start. This is part of wishing to seem “strong” and “self-reliant”. The sometimes testosterone driven world of martial arts would, at times, seem to support this mistaken and harmful view of “manliness". That is the truth, though I will say that places I have trained that were "serious", i.e. you had groups of long-term practitioners training hard together regularly, there was a kind of intimacy there that made this kind of attitude less likely, and made people more likely to talk about it if they needed help. I've had the same group of people for 5 or 6 years now, we know eachother well and can actually tell when someone is not doing so well, which speaks to what you said about the Dojo being a kind of social support network. The dojo can also offer a kind of social support that is far harder for people to find in the modern world I think, outside of religious institutions or actual support groups.